The cost for a traditional Thanksgiving dinner is at its lowest since 2010 according to Wisconsin Farm Bureau’s annual informal survey. “The survey’s total price of $47.91, when divided by 10, shows preparing a nutritious, home-cooked Thanksgiving meal costs less than $5 per person,” said Amy Eckelberg Wisconsin Farm Bureau’s spokesperson. “This year’s survey came in $2.17 lower than last year’s price of $50.08. 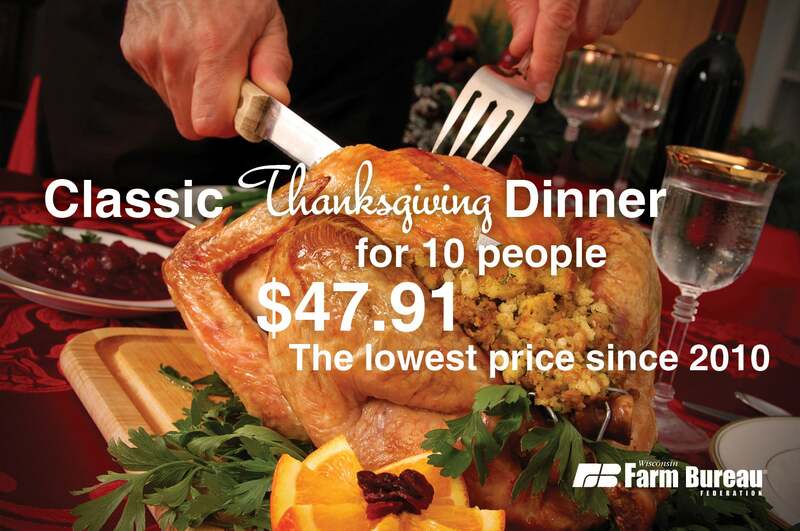 The American Farm Bureau Federation’s national survey of the same items (turkey, cubed stuffing, sweet potatoes, rolls with butter, peas, cranberries, a relish tray of carrots and celery, pumpkin pie with whipped cream and beverages of milk and coffee, all in quantities sufficient to serve 10 people) averaged $49.87, $1.96 more than Wisconsin’s price. Wisconsin’s average price for a 16-pound turkey was $23.36 in 2014 and remained at that price in 2015. This year the price of the same 16-pound turkey is $21.92, down $1.44. Turkey production across the U.S. was up about 8 percent this year, rebounding from the 2015 Avian Influenza crisis that occurred throughout the Midwest. Farmers have now fully recovered their flocks. Wisconsin’s Thanksgiving price survey is an informal, annual review of food price trends in relation to changing farm prices, weather and wholesale and retail food marketing. Members of the Wisconsin Farm Bureau collected price samples of 12 Thanksgiving food items in 25 communities in October and November. Farm Bureau volunteer shoppers are asked to look for the best possible prices, without taking advantage of special promotional coupons or purchase deals. While Farm Bureau does not make any scientific claims about the data, it is an informal gauge of price trends. The Wisconsin Farm Bureau Federation is the state’s largest farm organization. Made up of 61 county Farm Bureaus, it represents farms of every size, commodity and management style. The Thanksgiving price survey is an informal measure of prices at grocery stores in Wisconsin. The prices reported reflect variations in communities and retailers. The prices reported are not validated by any outside source. Prices were collected for this survey in the communities of Appleton, Ashland, Beloit, Chilton, De Pere, Dodgeville, Edgerton, Lake Geneva, Luxemburg, Manawa, Manitowoc, Marshfield, Medford, Mequon, Paddock Lake, Platteville, Plover, Richland Center, Saukville, Shawano, Sheboygan Falls, Union Grove, Waterford, Watertown and West Bend.